Q. I’ve got probably about 18 hats. I haven’t found any good solution to how to store them…hat boxes take up too much room and it’s hard to see what’s in each unless you take it down and look inside or through the front if there is a transparent window. The ways to organize baseball caps won’t work with women’s hats! Can you help? If you want to keep your hat collection dust-free yet easy to access, a glass door bookcase could work. Another dust-free storage solution is the CedarStow Hanging Organizer–it hangs from a closet rod and has six sections with cedar inserts that stabilize the shelves so they won’t sag. If you’re not concerned about dust, the Boutique Ivory 5-Tier Hat Display Rack stores and displays up to 15 hats. Q. My husband has managed to accumulate a dozen baseball caps and he leaves them piled on his dresser. He does wear them all so I’m not asking him to get rid of any, but I hate how messy they look. Can you recommend something that will keep them organized or at least tidier? 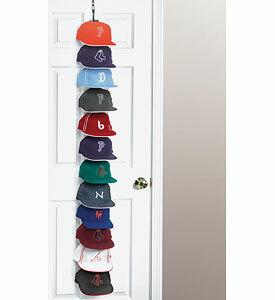 A. Over-the-door baseball hat racks are an effective and space-saving storage solution for cap collections. I think the Perfect Curve Cap Rack might be the best choice for your husband’s accumulation. It has 12 clips so he could use one for each of his dozen caps. The Wall-Mount Sports Gear Rack features three racks sized to hold everything from basketballs and soccer balls to helmets. Specialty hooks on the side are designed to hold baseball bats and tennis rackets, while six adjustable hooks on the bottom section are ideal for hanging caps, jackets and small accessories. The Sports Bench Organizer does double duty as a ventilated sports storage container that’s also a comfortable bench with handrails. The free-standing Sports Equipment Organizer helps you easily organize all sizes of balls, skates, sticks, bats and other gear by utilizing a grid design that lets you move nine hooks around so you can configure the rack to fit your sporting storage needs. It also includes a basket sized to corral smaller items such as tennis balls. For baseball cap collectors, Over-the-door Cap Racks provide a budget-friendly, space-saving way to store up to 16 caps. If that’s not enough to contain your cap collection, consider the Perfect Curve Cap Rack: it can hold up to 36 baseball caps for storage or display over a door, on a wall or even hanging from the ceiling. around for centuries but there weren’t any major variations until relatively recently. Now there’s the pyramid-shaped yet uniquely stackable Millinery Vault. This clever contraption (available in clear plastic, and in pink or red cardboard) is designed to protect hats and save space. A coordinated carry-handle makes them easy to transport. For storage and transport of cowboy hats and other brimmed hats, there’s the hinged Brim Styles Hat Storage Case, which includes a mirror and adjustable hat rest.